Robot Plane - Solar System Planets And Moons Section. Robot Plane Can Find Thermals to Stay Aloft. 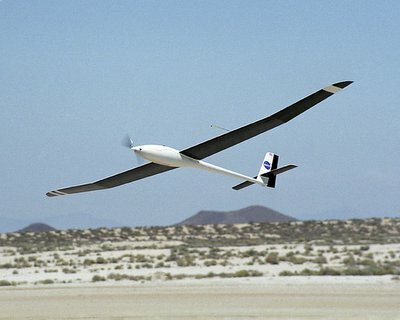 NASA engineers tested out a prototype unmanned sailplane this week at the Dryden Flight Research Center in California. This robotic aircraft is capable of detecting and using rising air thermals, similar to a glider or bird, to gain altitude. It launched from the ground, and navigated to a likely location for updrafts. Once it found a thermal, it turned off its engine and circled to stay within the updraft. NASA hopes to develop techniques for using thermals that could extend the range of unmanned aerial vehicles that often have very limited fuel. Unmanned prototype sailplane. Image credit: NASA. With the graceful flight of hawks and eagles in mind, NASA aerospace engineer Michael Allen recently hand-launched a 15-pound motorized model sailplane over the Southern California desert. He was hoping it would catch plumes of rising air called thermals. The sailplane did just that several times without human intervention during a series of research flights at NASA's Dryden Flight Research Center, Calif. The tests validated Allen's premise that using thermal lift could significantly extend the range and flight endurance of small unmanned air vehicles. Thermal lift increases vehicle endurance and saves fuel. This is significant, as small vehicle flight duration is often restricted by limited fuel capacity. Allen and his team of engineers and technicians flew the remote-controlled RnR Products sailplane 17 times from July through mid-September. The sailplane was modified by Dryden aerospace technicians to incorporate a small electric motor and an autopilot programmed to detect thermals. The 14-foot-wingspan model flew to an altitude of about 1,000 feet. The ground-based remote control pilot then handed off control to the sailplane's onboard autopilot. The autopilot software flew the plane on a pre-determined course over the northern portion of Rogers Dry Lake at Edwards Air Force Base, Calif., until it detected an updraft. As the aircraft rose with the updraft, the engine automatically shut off. The aircraft circled to stay within the lift from the updraft. Allen said the small sailplane added 60 minutes to its endurance by autonomous thermal soaring. The modified sailplane gained an average altitude in 23 updrafts of 565 feet, and in one strong thermal ascended 2,770 feet. "The flights demonstrated a small unmanned vehicle can mimic birds and exploit the free energy that exists in the atmosphere," Allen said. "We have been able to gather useful and unique data on updrafts and the response of the aircraft in updrafts. 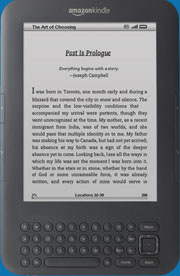 This will further the technology and refine the algorithms used."